W. Blair Bruce "The Smyths"
I saw this painting in Ottowa at the National Gallery of Canada. It is extraordinary in that it 'vibrates'. scroll down to see the details of his technique. It is a large painting, maybe 6'x8'. I also love the genre. 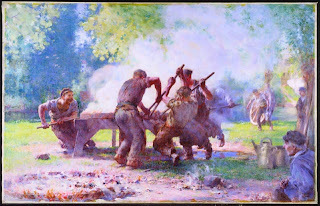 Wheelwrights have heated up an iron tire of a wooden wagon wheel probably to repair the fellows (spokes) of the wheel. I like to think the fellow in the lower right corner is the wagon owner. You can see another tire in the fire in the lower left. Perhaps a new tire. Pretty tough way to fix a flat! I'm off on another tangent in the studio using glaze techniques which is very interesting and brought back the image of Bruce's piece. The piece hung near the Group of Seven gallery which is why I went to Canadian National Gallery in Ottowa. I wasn't dissapointed by the extensive G of 7 collection but I discovered this piece and was delighted. The online photos don't do it justice as it is one of those paintings that has to be seen in person to appreciate. When I was in college, 40 years ago, sheesh has it been that long, I pursued something like this technique and have always been interested in 'broken color' of the impressionist but this is the first piece I have seen that emmulates such a tangent as 'additive light' as opposed to the 'subtractive light' common to most painting techniques. Computers and stage lighting use 'additive light' techniques. 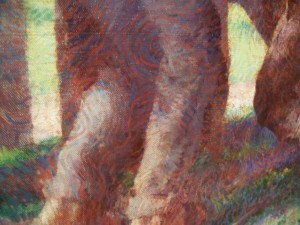 Bruce still employed the pointilist/impressionist technique of placing complimentary colors side by side to achieve a vibrating effect but had an extraordinarily exuberant yet deliberate brush technique using transparent glazing techniques. I think I will pursue this techniaque to achieve the challenge of dipicting Washington rainforests.